One of my favorite salt water fishes is Chilean sea bass. It is a rich and flavorful and holds up well when grilled. It doesn’t need much seasoning. It flakes delicately and is buttery in texture. A nice pairing with this fish is a side salad of fennel, bitter greens, and citrus fruit. They all cut through some of the fat that is inherent in this fish. Sea bass cooks perfectly on a George Foreman Grill. It can fall apart on an open flame grill. It requires very little preparation and takes only a few minutes to reach perfection. This species of fish does contain more fat than some others. The majority of that fat is mono and poly-unsaturated. It has no carbohydrates. It is a great source of protein and B vitamins. 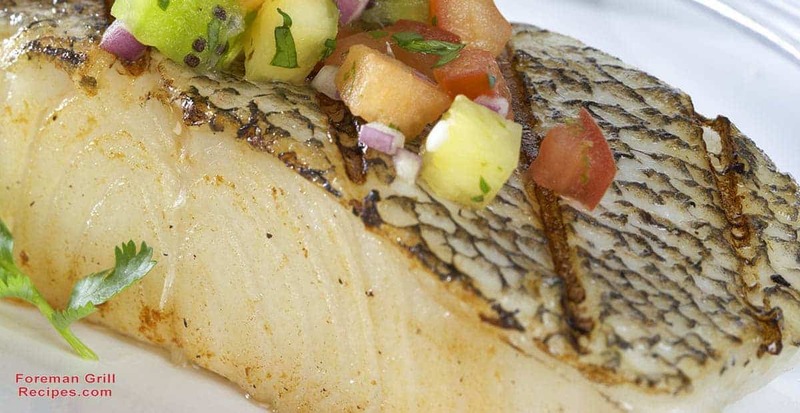 Sea bass is also loaded with potassium, selenium, phosphorous, and magnesium. Selenium is important for thyroid health, while magnesium is excellent for building strong muscle tissue and promoting restful sleep. What a great protein to enjoy at the end of a long day. Grilling sea bass is an easy and delicious way to prepare it. One thing to keep in mind is that it will release some fat when preparing it on the Foreman Grill. The basic grill works well for this recipe. Just make sure you have your drip pan in place and keep an eye on it. I recommend keeping the skin on while cooking the fish. It will help to hold it together. The skin gets crispy and is quite tasty. If you don’t care for fish skin, just remove it after grilling. 1. Preheat the Foreman Grill to high. 2. Coat the fish pieces all over with EVOO. Sprinkle with dill, salt, and pepper. 3. Place the fish skin side down on the grill and close the top. Grill for 6 minutes. Serve with lemon quarters and salad (recipe below). Fennel is best from fall through early spring. I like to serve this crunchy salad in the spring when the bulbs are sturdy and have that distinct anise flavor. The grapefruit adds a nice contrasting texture and sweetness. You could substitute oranges or tangerines. The bitter arugula herb adds another element and is what “seasons” the dish. The vinaigrette is simple because of all the other strong flavors. Make the salad ahead, or while the fish is grilling. 1. In a large bowl, whisk together the lemon juice, olive oil, and zest. Season this with salt and pepper to taste. 2. Trim the fennel bulb by slicing off the green, feathery stalks. Reserve some of the delicate leaves. Slice the bulb in half and cut out the dense tough core at the base of the bulb. Slice each section lengthwise in half again. Make thin slices across each quarter, just like you might slice an onion. This is the base of the salad. Add the fennel to the bowl. 3. Cut the onion in half and remove the skin. Place each half flat side down and slice as thinly as possible, just as you did for the fennel. Add the onion to the bowl. 4. Add 2 handfuls of baby arugula leaves to the bowl. 5. Cut the grapefruit in half. Using a small sharp knife, cut around the outside edge of the fruit to separate the white pith and skin from the flesh. Using the tip of the knife, run the blade along the membrane that is between each segment to remove the fruit more easily. Lift each 1/2 segment of fruit out of the skin with a spoon. Add the fruit to the bowl. 6. Toss all ingredients to coat with the vinaigrette. Garnish with some of the feathery leaves from the top stalks. Serve right away with the grilled fish. Some people are not wild about the anise flavor of raw fennel. If that is the case, feel free to grill the fennel quarters first on your Foreman grill. Cooking fennel, even a little bit, mellows it out and makes it a bit sweeter. As for the sea bass, you may need to vary the timing depending on how thick the filets are. Check with a fork for doneness after 5 minutes. It should be just opaque or milky in the center and not translucent.